Christie Aschwanden in Five Thirty Eight Science with a phenomenal piece on how science isn't broken. Gloria Galloway in The Globe and Mail with a heartbreaking piece on Canada's First Nations' health care failings. 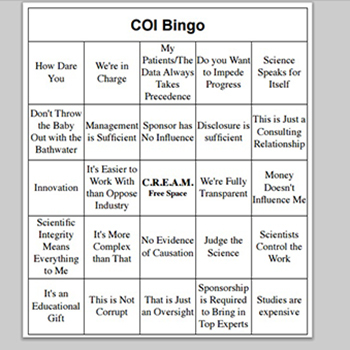 Daniel Goldberg in the British Medical Journal presents his fabulous game of conflict of interest bingo.